Photo by Nathan Gallagher/ Cape Farewell. The artwork shown is ‘Greenhouse Gas’ by Sunand Prasad. Five-times-Foyle Young Poet and TS Eliot Prize-nominated Helen Mort introduces the first of her four poetry writing challenges, asking you to respond to images from Cape Farewell’s archive of photos, videos and blog posts. The theme for this first challenge is disappearance. What happens when something disappears? Will it come back in another form or is it gone for good? What would you least like to disappear? Or what, perhaps, would you most like to disappear? Climate change and growing industrialisation is bringing many changes to our environments, such as loss of habitat, and the disappearance of whole glaciers bringing rising sea levels which threaten whole communities, as experienced by this teenager from Nunavut, Northern Canada. Look at this picture, taken from a project by the artist Sunand Prasad. The red balloons represent C02 emissions. 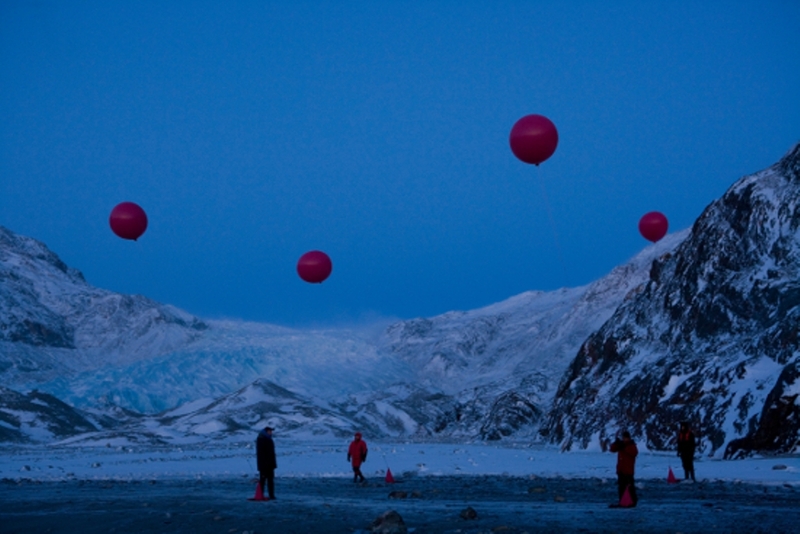 Together, the balloons mark out a cube representing the volume of space that would be taken up by 1 tonne of pure carbon dioxide. Carbon dioxide is the primary greenhouse gas emitted through human activities which is causing changes to the earth’s climate, including the gradual disappearance of some land forms and animal species. Then read Amanda Dalton’s poem ‘How to Disappear’. First rehearse the easy things. I love you. I’ll be back in half an hour. his watch, his wife, his ten pound note. Perfect it. Hold your breath a little longer every time. Eat less, much less, and take a vow of silence. Whatever you write, think about the theme of disappearing. You could take inspiration from Amanda’s poem to create your own set of instructions for a disappearance. What things could you lose and how? How hard would losing each thing be? You could try writing in the voice of the disappearing land or animals. How does ice feel when it melts? What do monkeys, birds or tigers fear as the rainforest is being stripped away? You could even write in the voice of carbon dioxide – how does it view its role in causing climate change? Or you could write about something you’ve lost, or something you don’t want to lose. What makes it special to you, and how do you feel about living without it? The winners of the four Cape Farewell challenges will have their poems set to music by famous composer David Julyan, who has written the musical scores for the films Memento and The Prestige, among many others! Winners will be published on the Young Poets Network and SWITCH websites, and there will be other goodies too. If you are a teacher reading this, we have good news! Helen has written a free downloadable Cape Farewell poetry lesson plan on the theme of ‘disappearance’, suitable for key stages 2, 3, 4 and 5. It’s part of our fantastic range of free downloadable Poetryclass resources and includes a class discussion, individual activities, tips for poem-building and a handout. The challenge is now closed – read the wonderful winners by following the links at the side of he page, and be inspired to write your own poem to submit to one of our Poetry Opportunities Page! Jamie Uy wrote her fantastic poem ‘No Return Policy’ in response to Karen McCarthy Woolf’s challenge to think about how much we buy, consume and throw away, and the cost to the environment of this way of life. Here, she explains how she processed the challenge to create her poem. I wrote ‘No Return Policy’ in response to the challenge of Consumerism and the Great White Sale. The last line – “Thank you for shopping at Paradise” – was the first one I thought of. I was intrigued by how one could take store names and shopping lingo and find deeper literary meanings within them. My strongest idea was to use mall language with satirizing ads, so then I racked my brain for quirky products to advertise that really sold the concept of an environmental ‘black market’ side to business. Actually, drafting the poem didn’t take long, but I thought about potential metaphors often as I strolled through malls, and I made sure to pay lots of attention to the way promotions were worded. These brainstorming techniques helped me find a solid foundation to build upon with verse. The poem draws its strength from the irony and bitterness used to represent the relationship between profits and exploitation. Our class was lucky enough to be studying ethical consumerism during the time I was drafting this poem, and this influenced my choice of metaphors to include “whitewash of conscience” and “freeze-dried ‘not my fault’ / excuses …”. By completing and winning the challenge, I pushed myself to apply what I had learned about ethical consumerism outside of the classroom/mall and into the word processor! To me, the best thing about the Cape Farewell challenges is that you – as a poet, doing what you love – have the potential to inspire real change and be recognized for it. I wish everyone the best of luck in whatever environmental challenges they choose to tackle this year! Helen Mort was born in Sheffield in 1985. Her collection Division Street is published by Chatto & Windus and was shortlisted for the TS Eliot Prize. She has published two pamphlets with tall-lighthouse press, the shape of every box and a pint for the ghost, a Poetry Book Society Choice for Spring 2010. Five-times winner of the Foyle Young Poets award, she received an Eric Gregory Award from The Society of Authors in 2007 and won the Manchester Young Writer Prize in 2008. In 2010, she became the youngest ever poet-in-residence at The Wordsworth Trust, Grasmere. Helen is also the new Derbyshire Poet Laureate. Hi, what is the line limit for poems? Thanks. Hiya, no line limit! We look forward to seeing your poem/s! /song as well? Thank you! Hi Jeanette, you can submit any poem as long as it responds to Helen’s themes. We aren’t necessarily looking for songs – the piece of music will respond to the poem on its own terms. Good luck! Hi,wondering if i can write, like about something which i once had but is now lost,like how i feel without it now…will it do?? Hi Sara, that sounds like a good theme! Thanks..i guess that it need not necessarily be environment related…am i correct??? Hi Sara, we are looking at broad themes to do with the environment, but the poems do not specifically need to be about the environment. Could you write about something metaphorically vanishing? Hi Alice, yes you could definitely write about that! Hi! What should the subject of the email be? Hi Stephanie, please put the name of the challenge or challenges you are entering in the subject header. Good luck! Hi Sazal, that’s great! Please send it to educationadmin@poetrysociety.org.uk. Do you have to enter all the challenges to have a chance of winning? Hi Alice, No you can just enter one challenge and you will have the same chance of winning that particular challenge as someone who has entered all of them! How do we know if our poems have been received? Will we get a confirmation email or should we assume that it’s all okay? Great challenge! Hi Simone, We don’t automatically let you know if your poems have been received but if you ask us to email and confirm we will do. We’ve just emailed confirming what we have received from you. Good luck!